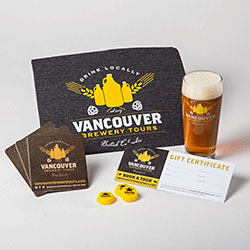 Gift Ideas - Vancouver Brewery Tours Inc. Looking for the ultimate gift for that beer lover in your life? Look no further. We’ve put together a nifty little package of some of our most popular items that are sure to impress even the craftiest of beer lovers, beer newbies, and we’re pretty sure it’ll convert a few wine lovers too! Tell us your size! Select the number of tees for purchase, and in the “Add Special Instructions to the Seller” state your requested t-shirt size. If you forget don’t worry! We’ll follow up to confirm. We currently stock unisex small, medium and large sizes. Once payment has been received and t-shirt size provided, you will receive an email within 24 hours (1 business day) confirming your order.